The thought, “margagogo needs a food stylist” is going to pop into your head when you see this picture. Then you’ll add it to your Cinco de Mayo menu. It’s easy to make – making me a fan of both the ice cream and the chef. First the chef: Nigella Lawson puts great pictures in her books. Yes, I like to see pictures before I decide what I’m going to cook. It helps me to know what I’m aiming for. And I’m a fan because when she says a recipe’s easy, it is. With my limited cooking skills I’ve been able to repeat her results and wow my friends. 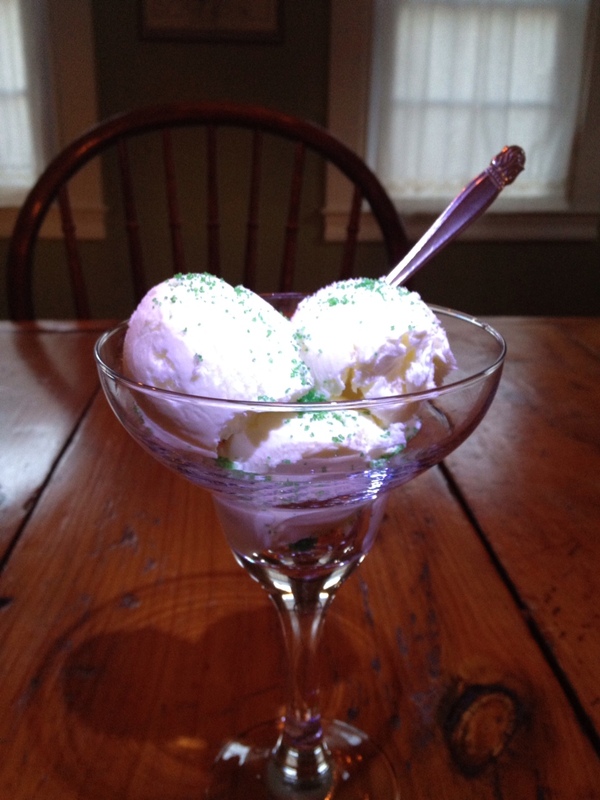 Now the Ice Cream: When I made Margarita Ice Cream for dessert on New Year’s Eve, I got raves from my guests. Some of them aren’t margarita drinkers, some don’t really like sweets and the crazier ones don’t really crave ice cream and one isn’t a drinker at all. Yet, everyone loved Margarita Ice Cream. Margarita + Ice Cream = Cinco de Mayo, Summer and Celebration! Holy Margarita Cow – This Stuff is Great! You’re making that next you come up! Yes, indeed – Margarita Ice Cream! You should try it! The effort to rave ratio is way in your favor.